This volume brings together contributions from eminent academics and senior ACAS officials to provide a fascinating account of the agency's achievements, failures and remarkable survival during a period of political upheaval and dramatic economic and industrial relations change. Brian Towers teaches in the Department of Human Resource Management, Nottingham Business School, Nottingham Trent University. He is the founder and editor of Industrial Relations Journal and an ACAS arbitrator with extensive experience in the practice of industrial relations and human resource management. 1. Introduction: John Houghton (Chairman, ACAS). 2. The First Quarter Century: William Brown (University of Cambridge) and Brian Towers (Nottingham Trent University). 3. Setting the Pace or Running Alongside? 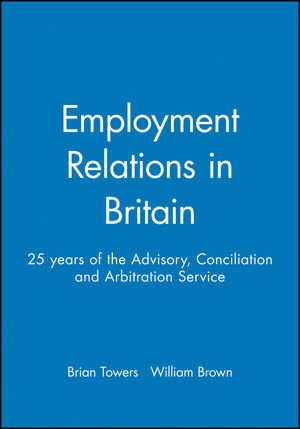 ACAS and the Changing Employment Relationship: Bill Hawes. 4. Building Bridges and Settling Differences: Collective Conciliation and Arbitration Under ACAS: John Goodman. 5. Doing More With Less: ACAS and Individual Conciliation: Linda Dickens. 6. Doing it with Style: The Work of the ACAS Conciliator in Individual Employment Rights Cases: Gill Dix. 7. Learning from a Repeating History? ACAS and Trade Union Recognition: Stephen Wood. 8. Supporting Collective Bargaining: Some Comparative Reflections: Bob Hepple. 9. After Collective Bargaining? ACAS in the Age of Human Resource Management: John Purcell. 10. The Best and the Worst of Times: Survival and Progress, 1974-2000 and Beyond: Brian Towers and William Brown. "This book provides an admirably concise, well referenced source of information..." Industrial Law Journal, Vol 30.